NACA promised distressed homeowners face-to-face meetings with bankers, like Ollie. There’s help for Idyllwild homeowners who are upside down on their mortgages, behind on their payments or even in foreclosure. The Neighborhood Assistance Corporation of America (NACA) is coming to the rescue! The grassroots group with “No Loan Sharks” on their T-shirts will be at the San Diego Convention Center Feb. 9-13, and the Los Angeles Convention Center Feb. 16-20. Gather your paperwork and go! NACA just helped hundreds of distressed homeowners at the Ontario Convention Center this past weekend. For free, NACA will help you organize your finances so the final package is presentable to your banker. And they will get you a face-to-face meeting with one on the spot. Throughout the day at the Ontario Convention Center, happy homeowners told others over the loud speaker how NACA and their banks lowered their interest rates and payments. Many spoke only in Spanish. Others thanked God, NACA and their bank (in that order), for the change that had taken place. I didn’t go to the podium, but I was “saved” by NACA last Monday. I was behind in my $1300/month mortgage payments and facing a Feb. 14 foreclosure date. After completing the process, Bank of America shaved off $150 of my monthly payment and lowered my interest rate from 6.25 percent to 2 percent. Bank of America bankers worked hard with homeowners and approved nearly 80 percent of modifications, NACA said. I live on Marion View Drive in Idyllwild, and I was months behind on my payments. At the time that I went to the NACA event, Bank of America was considering me for my third modification, but the prospects didn’t look good. Days before, a foreclosure sale date was posted on my door while I was doing the dishes. Then my neighbor, Louise, told me about NACA at the Ontario Convention Center. People were getting approved for modifications on the spot. In fact, Bank of America was approving 80 percent! Louise had seen it on TV. My mother encouraged me not to wait until Monday, but go on Friday afternoon. It was a smart move, because the whole process took me three days. When I walked into the Ontario Convention Center that afternoon, I felt like a weight had been lifted off of me. I was with 2,000 other people who were in the same boat. Everyone was struggling to keep up with payments in this economy, and were at risk of losing their homes. We were hardworking, but were getting the “run around” from our banks. Since I work as a freelancer, NACA put me in the self-employed group for orientation. We all laughed because it was true. But she was going to show us how to make it work. She told us to bring six months of bank statements, our 2009 and 2010 tax returns, homeowner’s insurance and various other documents (for a complete listing, visit www.naca.com). Before morning, we had to add up all the business expenses and deposits. But first I had to find everything. I sat in a sea of paperwork, hoping that I got everything. After all, Ontario was two hours away, and I couldn’t run back just to get something! The NACA event was widely attended because it promised face-to-face meetings with a banker. For those of us who have gone through modifications before, it’s frustrating that you can never speak to a banker in person. I returned on Sunday (because I had to work Saturday) with my paperwork. 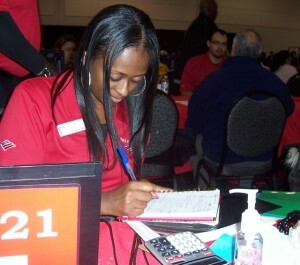 They had rows and rows of tables with calculators set up to assist. Once you had all of your paperwork ready, then you had to get in line to have it checked. That took about an hour. Once you were checked, then you got a number, and waited for one of the six NACA counselors to look over your paperwork and signed off on it. Then you were ready to speak to a banker. The counselor finally approved my paperwork at 11 p.m. Sunday night. I walked out to an empty parking lot at the Ontario Convention Center. It was a beautiful and eerie sight. The next day should have gone smoothly, but I noticed that my bank statements were out of sequence. During Orientation and other times, NACA volunteers would tell stories about homeowners who were sent back to the drawing table because their paperwork wasn’t in order. We were all afraid of making the same mistake. So I waited to talk to John, who was working with a young couple, so I passed him a note. An hour and a half later, I was still waiting. Then I began to panic that I wouldn’t make it through the process in time. He finally told me that he didn’t have time to correct any mistakes. Other NACA volunteers told me to go to the next step in the process. Why did he keep me waiting for so long? What if I lose my home because I waited too long to get through the process? The NACA counselor told me to stop and take several deep breaths. I calmed myself. Everything was going to be OK, he said. I had mascara running down my face. I was sleep-deprived and hungry. And had just spent two days getting my paperwork together. Now I was going to talk to a banker? The next stop was to sit at a table with phones. In the center, there were two NACA employees who faxed your paperwork to the NACA counselors whom you spoke to over the phone. This was the last step before you spoke with a banker about modifying your loan. Ollie, my B of A banker, worked hard to "crunch my numbers" and make my modification work. On one side of me, a middle-aged Mexican man was speaking to the counselor via a translator. He worked for UPS. Then he got depressed and didn’t work for three years. Now his benefits are running out, and he’s worried about losing his home. The woman at my right went through bankruptsy when her husband left and she had huge house payments. When she got on the phone with her NACA counselor, she opened up a four-inch binder of all her materials, each color-coded. My shabby Stater Bros. shopping bag reflected how I looked and felt. I told Mary about being an artist in Idyllwild. How I loved my home, and planted a new tree each year. I wanted her to see the “human” side of the paperwork. I knew that I didn’t make enough money to afford my home. Freelance is unpredictable. It’s gravy one month, and zilch the next. Yet, I told Mary that I was working hard to improve my income. I cut back on my expenses. I didn’t buy clothes or go out to eat anymore. Forget about vacations. When Mary asked me if I donated to the church, or gave to charity, I knew that I had to say something besides, “no.” When your home is on the line, you must pay attention to who is helping you. NACA’s headquarters is located in the Bible Belt, where God and family still mean something. I didn’t donate regularly to my church, but I am charitable. 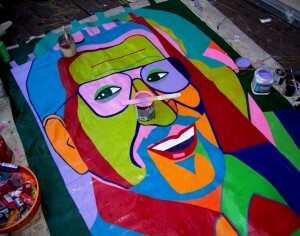 I told Mary about the time I donated an 8-foot Herb Jeffries banner to a Cafe Aroma fundraiser at Cafe Aroma. The Pop Art banner was worth $800, but Herb needed money for his medical bills. I donated the banner that sold for about $300. Cafe Aroma presented the banner to Herb along with the money. I told her how I cleaned houses and walked dogs to make ends meet. Mary went over my financials, including my credit report. She wished me well and I was shuffled over to another line, and then waited in a new area. 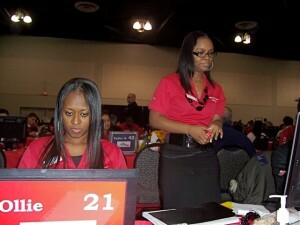 In front of us, there were about 100 Bank of America bankers all dressed in red polos shirts. Each was helping people like us modify their loans. They’d call out names and bring them over to their assigned bankers. One by one, we saw people getting up and receiving help. It was even entertaining. Whenever a modification was approved, the Bank of America banker would hit a gong, and many of the others would stop and shake their “clappers” or tambourines in a momentarily “celebration.” This was very encouraging for those of us waiting in the wings. It seemed like Bank of America approved new modification every 15 minutes. This was good news for NACA. For every successful modification, they received $150, according to the NACA paperwork. This was a small price to pay to have NACA guide homeowners through the process. She was from San Francisco and had just driven seven hours with her family to get here. This was her second NACA event. Months earlier, she had driven to Texas, but didn’t get the modification. NACA said she needed to be working, so she got another accountant job and updated her paperwork. 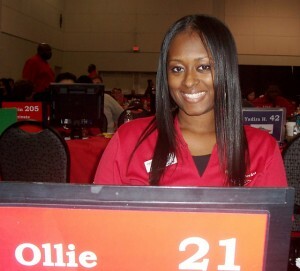 When I finally got to set before Ollie, my pretty Bank of America banker. I was out of words. My contacts were tearing into my eyes and my stomach was in knots. What could I say to make her want to help me? “They caught me up, but never lowered my payments,” I told him. He checked another screen and verified it. With a lower payment, I could weather whatever came along. Ollie and he shaved off $150 off my payment and (gasp!) lowered my interest rate from 6.25 percent to two percent. Over the past seven years, I’ve only been paying on interest and not the principal. “I haven’t seen a two percent interest rate since college more than 25 years ago,” I confessed. A lump grew in my throat and tears welled in my eyes. This was a beautiful day! My first new low payment was due in two days, but I was ready. When I got into the NACA line to check out, they told me to make sure to ask Bank of America for my final documents (after the three month provision payments were paid). “If you don’t hear from Bank of America, then you call us,” the burly NACA volunteer said. They seemed like a Union to me, but it made me feel good that NACA “had my back.” No one was going to take my house away from me. There’s hope for other Idyllwild homeowners this month. NACA and the bankers (including Bank of America, Chase, Wells Fargo, Idy Mac and many more) will be at the San Diego Convention Center Feb. 9-13, and the Los Angeles Convention Center Feb. 16-20. For more information, visit www.naca.com.